Jennifer Culkin is a critical care nurse at Harborview Medical Center and a former helicopter flight nurse. In the course of her 30-year career, she has cared for people of all ages, from premature infants to senior citizens. 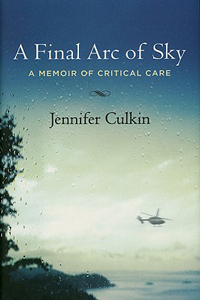 Her debut book A Final Arc of Sky (2009) describes Culkin's experiences as a nurse. Through these experiences, Culkin explores the overlap between her work and her private life, where her caregiving extends to her sons, her dying mother, her father, and finally, as she adjusts to life with multiple sclerosis, herself. A fellow author, Robin Hemley, summarizes Culkin's first book as follows: "Rarely have we heard from such an eloquent yet urgent voice from the frontlines of mortality. Jennifer Culkin, a writer of enormous talents, brings us too close for comfort to a variety of intense locales: the wreckage of a highway pileup, the inside of a pediatric intensive care unit, her father's deathbed. She writes with elegiac grace and unblinking honesty of our collective determination to sustain life, limb and, above all, dignity." Another author, Ann Pancake, says of Culkin's book: "A Final Arc of Sky is one of the very few books I've read that is simultaneously 'I-can't-stop-turning-pages' riveting and profoundly meditative. With her electrifying scenes, her gorgeous sentences, and her provocative explorations of the borderland between life and death, Culkin engaged my heart, my intellect, my artistic sensibility, and my adrenaline. A remarkable debut." For more information about Jennifer Culkin go to http://jenniferculkin.com/.